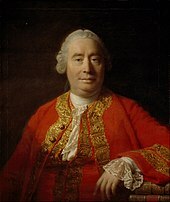 Classical economics, modern free market, division of labour, the " invisible hand"
Smith published The Theory of Moral Sentiments in 1759, embodying some of his Glasgow lectures. This work was concerned with how human morality depends on sympathy between agent and spectator, or the individual and other members of society. Smith defined "mutual sympathy" as the basis of moral sentiments. He based his explanation, not on a special "moral sense" as the Third Lord Shaftesbury and Hutcheson had done, nor on utility as Hume did, but on mutual sympathy, a term best captured in modern parlance by the 20th-century concept of empathy, the capacity to recognise feelings that are being experienced by another being. From Geneva, the party moved to Paris. Here, Smith met Benjamin Franklin, and discovered the Physiocracy school founded by François Quesnay. Physiocrats were opposed to mercantilism, the dominating economic theory of the time, illustrated in their motto Laissez faire et laissez passer, le monde va de lui même! (Let do and let pass, the world goes on by itself!). 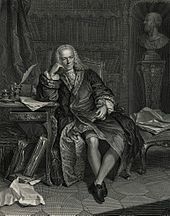 The wealth of France had been virtually depleted by Louis XIV [b] and Louis XV in ruinous wars, [c] and was further exhausted in aiding the American insurgents against the British. The excessive consumption of goods and services deemed to have no economic contribution was considered a source of unproductive labour, with France's agriculture the only economic sector maintaining the wealth of the nation. [ citation needed] Given that the English economy of the day yielded an income distribution that stood in contrast to that which existed in France, Smith concluded that "with all its imperfections, [the Physiocratic school] is perhaps the nearest approximation to the truth that has yet been published upon the subject of political economy." The distinction between productive versus unproductive labour—the physiocratic classe steril—was a predominant issue in the development and understanding of what would become classical economic theory. 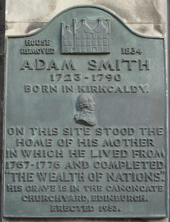 A commemorative plaque for Smith is located in Smith's home town of Kirkcaldy. Smith's library went by his will to David Douglas, Lord Reston (son of his cousin Colonel Robert Douglas of Strathendry, Fife), who lived with Smith. It was eventually divided between his two surviving children, Cecilia Margaret (Mrs. Cunningham) and David Anne (Mrs. Bannerman). On the death in 1878 of her husband, the Reverend W. B. Cunningham of Prestonpans, Mrs. Cunningham sold some of the books. The remainder passed to her son, Professor Robert Oliver Cunningham of Queen's College, Belfast, who presented a part to the library of Queen's College. After his death, the remaining books were sold. 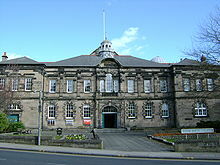 On the death of Mrs. Bannerman in 1879, her portion of the library went intact to the New College (of the Free Church) in Edinburgh and the collection was transferred to the University of Edinburgh Main Library in 1972. Disagreement exists between classical and neoclassical economists about the central message of Smith's most influential work: An Inquiry into the Nature and Causes of the Wealth of Nations (1776). 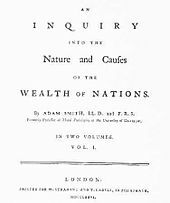 Neoclassical economists emphasise Smith's invisible hand,  a concept mentioned in the middle of his work – Book IV, Chapter II – and classical economists believe that Smith stated his programme for promoting the "wealth of nations" in the first sentences, which attributes the growth of wealth and prosperity to the division of labour. Smith used the term " the invisible hand" in "History of Astronomy"  referring to "the invisible hand of Jupiter", and once in each of his The Theory of Moral Sentiments  (1759) and The Wealth of Nations  (1776). This last statement about "an invisible hand" has been interpreted in numerous ways. As every individual, therefore, endeavours as much as he can both to employ his capital in the support of domestic industry, and so to direct that industry that its produce may be of the greatest value; every individual necessarily labours to render the annual revenue of the society as great as he can. He generally, indeed, neither intends to promote the public interest, nor knows how much he is promoting it. By preferring the support of domestic to that of foreign industry, he intends only his own security; and by directing that industry in such a manner as its produce may be of the greatest value, he intends only his own gain, and he is in this, as in many other cases, led by an invisible hand to promote an end which was no part of his intention. Nor is it always the worse for the society that it was no part of it. By pursuing his own interest he frequently promotes that of the society more effectually than when he really intends to promote it. I have never known much good done by those who affected to trade for the public good. It is an affectation, indeed, not very common among merchants, and very few words need be employed in dissuading them from it. The neoclassical interest in Smith's statement about "an invisible hand" originates in the possibility of seeing it as a precursor of neoclassical economics and its concept of general equilibrium – Samuelson's "Economics" refers six times to Smith's "invisible hand". To emphasise this connection, Samuelson  quotes Smith's "invisible hand" statement substituting "general interest" for "public interest". Samuelson  concludes: "Smith was unable to prove the essence of his invisible-hand doctrine. Indeed, until the 1940s, no one knew how to prove, even to state properly, the kernel of truth in this proposition about perfectly competitive market." Classical economists presented competing theories of those of Smith, termed the " labour theory of value". Later Marxian economics descending from classical economics also use Smith's labour theories, in part. The first volume of Karl Marx's major work, Das Kapital, was published in German in 1867. In it, Marx focused on the labour theory of value and what he considered to be the exploitation of labour by capital. The labour theory of value held that the value of a thing was determined by the labour that went into its production. This contrasts with the modern contention of neoclassical economics, that the value of a thing is determined by what one is willing to give up to obtain the thing. Smith's most prominent disciple in 19th-century Britain, peace advocate Richard Cobden, preferred the first proposal. Cobden would lead the Anti-Corn Law League in overturning the Corn Laws in 1846, shifting Britain to a policy of free trade and empire "on the cheap" for decades to come. This hands-off approach toward the British Empire would become known as Cobdenism or the Manchester School. By the turn of the century, however, advocates of Smith's second proposal such as Joseph Shield Nicholson would become ever more vocal in opposing Cobdenism, calling instead for imperial federation. As Marc-William Palen notes: "On the one hand, Adam Smith’s late nineteenth and early twentieth-century Cobdenite adherents used his theories to argue for gradual imperial devolution and empire ‘on the cheap’. On the other, various proponents of imperial federation throughout the British World sought to use Smith's theories to overturn the predominant Cobdenite hands-off imperial approach and instead, with a firm grip, bring the empire closer than ever before." Smith's ideas thus played an important part in subsequent debates over the British Empire. A large-scale memorial of Smith by Alexander Stoddart was unveiled on 4 July 2008 in Edinburgh. It is a 10-foot (3.0 m)-tall bronze sculpture and it stands above the Royal Mile outside St Giles' Cathedral in Parliament Square, near the Mercat cross. 20th-century sculptor Jim Sanborn (best known for the Kryptos sculpture at the United States Central Intelligence Agency) has created multiple pieces which feature Smith's work. At Central Connecticut State University is Circulating Capital, a tall cylinder which features an extract from The Wealth of Nations on the lower half, and on the upper half, some of the same text, but represented in binary code. 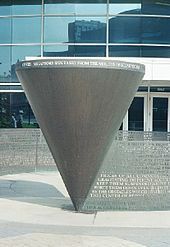 At the University of North Carolina at Charlotte, outside the Belk College of Business Administration, is Adam Smith's Spinning Top. Another Smith sculpture is at Cleveland State University. He also appears as the narrator in the 2013 play The Low Road, centred on a proponent on laissez-faire economics in the late 18th century, but dealing obliquely with the financial crisis of 2007–2008 and the recession which followed; in the premiere production, he was portrayed by Bill Paterson. A bust of Smith is in the Hall of Heroes of the National Wallace Monument in Stirling. 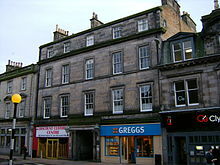 Adam Smith resided at Panmure House from 1778 to 1790. This residence has now been purchased by the Edinburgh Business School at Heriot Watt University and fundraising has begun to restore it. Part of the Northern end of the original building appears to have been demolished in the 19th century to make way for an iron foundry. Some commentators have argued that Smith's works show support for a progressive, not flat, income tax and that he specifically named taxes that he thought should be required by the state, among them luxury-goods taxes and tax on rent. Yet Smith argued for the "impossibility of taxing the people, in proportion to their economic revenue, by any capitation" (The Wealth of Nations, V.ii.k.1). Smith argued that taxes should principally go toward protecting "justice" and "certain publick institutions" that were necessary for the benefit of all of society, but that could not be provided by private enterprise (The Wealth of Nations, IV.ix.51). However, he added that in general, a retaliatory tariff "seems a bad method of compensating the injury done to certain classes of our people, to do another injury ourselves, not only to those classes, but to almost all the other classes of them" (The Wealth of Nations, IV.ii.39). A landlord, a farmer, a master manufacturer, a merchant, though they did not employ a single workman, could generally live a year or two upon the stocks which they have already acquired. Many workmen could not subsist a week, few could subsist a month, and scarce any a year without employment. In the long run, the workman may be as necessary to his master as his master is to him, but the necessity is not so immediate. ^ Billington, James H. (1999). Fire in the Minds of Men: Origins of the Revolutionary Faith. Transaction Publishers. p. 302. ^ Stedman Jones, Gareth (2006). "Saint-Simon and the Liberal origins of the Socialist critique of Political Economy". In Aprile, Sylvie; Bensimon, Fabrice (eds.). La France et l’Angleterre au XIXe siècle. Échanges, représentations, comparaisons. Créaphis. pp. 21–47. ^ "Adam Smith (1723–1790)". BBC. Adam Smith's exact date of birth is unknown, but he was baptised on 5 June 1723. ^ "Great Thinkers of the Scottish Enlightenment". ^ Sharma, Rakesh. "Adam Smith: The Father of Economics". Investopedia. Retrieved 20 February 2019. ^ "Absolute Advantage – Ability to Produce More than Anyone Else". Corporate Finance Institute. Retrieved 20 February 2019. ^ a b "100 Best Scottish Books, Adam Smith". Retrieved 31 January 2012. ^ Introductory Economics. New Age Publishers. p. 4. ISBN 81-224-1830-9. ^ Winch, Donald (September 2004). "Smith, Adam (bap. 1723, d. 1790)". Dictionary of National Biography. Oxford University Press. 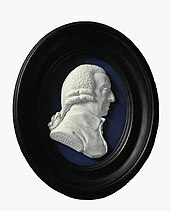 ^ "MyGlasgow – Archive Services – Exhibitions – Adam Smith in Glasgow – Photo Gallery – Honorary degree". University of Glasgow. Retrieved 6 November 2018. ^ Smith, A., 1976, The Wealth of Nations edited by R. H. Campbell and A. S. Skinner, The Glasgow edition of the Works and Correspondence of Adam Smith, vol. 2b, p. 678. ^ Durant, Will; Durant, Ariel (1 July 1967). The Story of Civilization: Rousseau and Revolution. MJF Books. ISBN 1567310214. ^ Boswell's ' Life of Samuel Johnson, 1780. ^ Stewart, Dugald (1853). The Works of Adam Smith: With An Account of His Life and Writings. London: Henry G. Bohn. lxix. OCLC 3226570. ^ "Times obituary of Adam Smith". 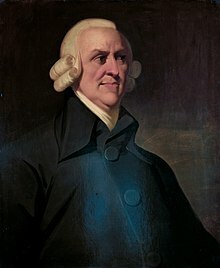 The Times: http://en.wikisource.org/wiki/The_Times/1790/Obituary/Adam_Smith. 24 July 1790. ^ Hill, L. (2001). "The hidden theology of Adam Smith". The European Journal of the History of Economic Thought. 8: 1–29. doi: 10.1080/713765225. ^ "Hume on Religion". Stanford Encyclopedia of Philosophy. Retrieved 26 May 2008. ^ Eric Schliesser (2003). "The Obituary of a Vain Philosopher: Adam Smith's Reflections on Hume's Life" (PDF). Hume Studies. 29 (2): 327–62. ^ "Andrew Millar Project, University of Edinburgh". millar-project.ed.ac.uk. Retrieved 3 June 2016. ^ Adam Smith, Glasgow Edition of the Works and Correspondence Vol. 1 The Theory of Moral Sentiments . ^ Falkner, Robert (1997). 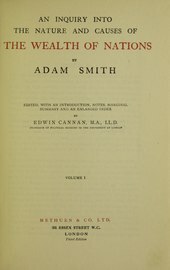 "Biography of Smith". Liberal Democrat History Group. Archived from the original on 11 June 2008. Retrieved 14 May 2008. ^ Wight, Jonathan B. Saving Adam Smith. Upper Saddle River: Prentic-Hall, Inc., 2002. ^ Robbins, Lionel. A History of Economic Thought. Princeton: Princeton University Press, 1998. ^ Brue, Stanley L., and Randy R. Grant. The Evolution of Economic Thought. Mason: Thomson Higher Education, 2007. ^ Otteson, James R. 2002, Adam Smith's Marketplace of Life. Cambridge: Cambridge University Press, 2002. ^ Ekelund, R. & Hebert, R. 2007, A History of Economic Theory and Method 5th Edition. Waveland Press, United States, p. 105. ^ Smith, A., 1976, The Wealth of Nations edited by R. H. Campbell and A. S. Skinner, The Glasgow edition of the Works and Correspondence of Adam Smith, vol. 2a, p. 456. ^ Smith, A., 1980, The Glasgow edition of the Works and Correspondence of Adam Smith, vol. 3, p. 49, edited by W. P. D. Wightman and J. C. Bryce, Oxford: Clarendon Press. ^ Smith, A., 1976, The Glasgow edition of the Works and Correspondence of Adam Smith, vol. 1, pp. 184–85, edited by D. D. Raphael and A. L. Macfie, Oxford: Clarendon Press. ^ Smith, A., 1976, The Glasgow edition of the Works and Correspondence of Adam Smith, vol. 2a, p. 456, edited by R. H. Cambell and A. S. Skinner, Oxford: Clarendon Press. ^ Smith, A., 1976, The Glasgow edition, vol. 2a, pp. 26–27. ^ Mandeville, B., 1724, The Fable of the Bees, London: Tonson. ^ Smith, A., 1976, The Glasgow edition, vol. 2a, pp. 145, 158. ^ Smith, A., 1976, The Glasgow edition, vol. 2a, p. 79. ^ Gopnik, Adam. "Market Man". The New Yorker (18 October 2010): 82. Retrieved 27 April 2011. ^ Samuelson, P. A./Nordhaus, William D., 1989, Economics, 13th edition, N.Y. et al. : McGraw-Hill, p. 825. ^ Samuelson, P. A./Nordhaus, William D., 1989, idem, p. 825. ^ Stewart, D., 1799, Essays on Philosophical Subjects, to which is prefixed An Account of the Life and Writings of the Author by Dugald Steward, F.R.S.E., Basil; from the Transactions of the Royal Society of Edinburgh, Read by M. Steward, 21 January, and 18 March 1793; in: The Glasgow edition of the Works and Correspondence of Adam Smith, 1982, vol. 3, pp. 304 ff. ^ a b "A Critique of Political Economy" (PDF). ^ "Adam Smith – Jonathan Swift". University of Winchester. Archived from the original on 28 November 2009. Retrieved 11 February 2010. ^ Stigler, George J. (1976). "The Successes and Failures of Professor Smith," Journal of Political Economy, 84(6), pp. 1199–213, 1202. Also published as Selected Papers, No. 50 (PDF)[ permanent dead link], Graduate School of Business, University of Chicago. ^ Samuelson, Paul A. (1977). "A Modern Theorist's Vindication of Adam Smith," American Economic Review, 67(1), p. 42. Reprinted in J.C. Wood, ed., Adam Smith: Critical Assessments, pp. 498–509. Preview. ^ Schumpeter History of Economic Analysis. New York: Oxford University Press. p. 185. ^ Mandel, Ernest (1987). "Marx, Karl Heinrich", The New Palgrave: A Dictionary of Economics v. 3, pp. 372, 376. ^ Marshall, Alfred; Marshall, Mary Paley (1879). The Economics of Industry. p. 2. ^ Jevons, W. Stanley (1879). The Theory of Political Economy (2nd ed.). p. xiv. ^ Clark, B. (1998). Political-economy: A comparative approach, 2nd ed., Westport, CT: Praeger. p. 32. 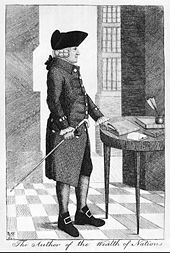 ^ Marc-William Palen, “Adam Smith as Advocate of Empire, c. 1870–1932,” Historical Journal 57: 1 (March 2014): 179–98. ^ "Clydesdale 50 Pounds, 1981". Ron Wise's Banknoteworld. Archived from the original on 30 October 2008. Retrieved 15 October 2008. ^ "Current Banknotes : Clydesdale Bank". The Committee of Scottish Clearing Bankers. Archived from the original on 3 October 2008. Retrieved 15 October 2008. ^ "Smith replaces Elgar on £20 note". BBC. 29 October 2006. Archived from the original on 24 March 2007. Retrieved 14 May 2008. ^ Blackley, Michael (26 September 2007). 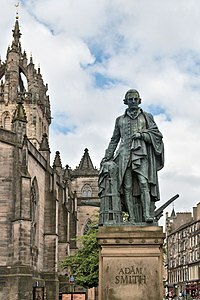 "Adam Smith sculpture to tower over Royal Mile". Edinburgh Evening News. ^ Fillo, Maryellen (13 March 2001). "CCSU welcomes a new kid on the block". The Hartford Courant. ^ Kelley, Pam (20 May 1997). "Piece at UNCC is a puzzle for Charlotte, artist says". Charlotte Observer. ^ Shaw-Eagle, Joanna (1 June 1997). "Artist sheds new light on sculpture". The Washington Times. ^ "Adam Smith's Spinning Top". Ohio Outdoor Sculpture Inventory. Archived from the original on 5 February 2005. Retrieved 24 May 2008. ^ "The restoration of Panmure House". Archived from the original on 22 January 2012. ^ "Adam Smith's Home Gets Business School Revival". Bloomberg. ^ "The Adam Smith Society". The Adam Smith Society. Archived from the original on 21 July 2007. Retrieved 24 May 2008. ^ Choi, Amy (4 March 2014). "Defying Skeptics, Some Business Schools Double Down on Capitalism". Bloomberg Business News. Retrieved 24 February 2015. ^ "Who We Are: The Adam Smith Society". Retrieved 2 February 2019. ^ "The Australian Adam Smith Club". Adam Smith Club. Retrieved 12 October 2008. ^ Levy, David (June 1992). "Interview with Milton Friedman". Federal Reserve Bank of Minneapolis. Retrieved 1 September 2008. ^ "FRB: Speech, Greenspan – Adam Smith – 6 February 2005". Archived from the original on 12 May 2008. Retrieved 31 May 2008. ^ "Adam Smith: Web Junkie". Forbes. 5 July 2007. Archived from the original on 20 May 2008. Retrieved 10 June 2008. ^ Stein, Herbert (6 April 1994). "Board of Contributors: Remembering Adam Smith". The Wall Street Journal Asia: A14. ^ Brown, Vivienne; Pack, Spencer J.; Werhane, Patricia H. (January 1993). "Untitled review of 'Capitalism as a Moral System: Adam Smith's Critique of the Free Market Economy' and 'Adam Smith and his Legacy for Modern Capitalism'". The Economic Journal. 103 (416): 230–32. doi: 10.2307/2234351. JSTOR 2234351. ^ "Market Man". The New Yorker. 18 October 2010. ^ Smith, A., 1976, The Glasgow edition, vol. 2a, p. 468. ^ Viner, Jacob (April 1927). "Adam Smith and Laissez-faire". The Journal of Political Economy. 35 (2): 198–232. doi: 10.1086/253837. JSTOR 1823421. ^ Klein, Daniel B. (2008). "Toward a Public and Professional Identity for Our Economics". Econ Journal Watch. 5 (3): 358–72. ^ Klein, Daniel B. (2009). "Desperately Seeking Smithians: Responses to the Questionnaire about Building an Identity". Econ Journal Watch. 6 (1): 113–80. ^ a b Buchholz, Todd (December 1990). pp. 38–39. Benians, E.A. (1925). " Adam Smith’s Project of an Empire." Cambridge Historical Journal 1 (3): 249–83. Bonar, James, ed. (1894). A Catalogue of the Library of Adam Smith. London: Macmillan. OCLC 2320634 – via Internet Archive. Buchan, James (2006). The Authentic Adam Smith: His Life and Ideas. W.W. Norton & Company. ISBN 0-393-06121-3. Buchholz, Todd (1999). New Ideas from Dead Economists: An Introduction to Modern Economic Thought. Penguin Books. ISBN 0-14-028313-7. Bussing-Burks, Marie (2003). Influential Economists. Minneapolis: The Oliver Press. ISBN 1-881508-72-2. Campbell, R.H.; Skinner, Andrew S. (1985). Adam Smith. Routledge. ISBN 0-7099-3473-4. Coase, R.H. (October 1976). "Adam Smith's View of Man". The Journal of Law and Economics. 19 (3): 529–46. doi: 10.1086/466886. Palen, Marc-William (March 2014). " Adam Smith as Advocate of Empire, c. 1870–1932." Historical Journal 57 (1): 179–98. Rae, John (1895). Life of Adam Smith. London & New York: Macmillan. ISBN 0-7222-2658-6. Retrieved 14 May 2018 – via Internet Archive. Ross, Ian Simpson (1995). The Life of Adam Smith. Oxford University Press. ISBN 0-19-828821-2. Ross, Ian Simpson (2010). The Life of Adam Smith (2 ed.). Oxford University Press. Skousen, Mark (2001). The Making of Modern Economics: The Lives and Ideas of Great Thinkers. M.E. Sharpe. ISBN 0-7656-0480-9. Smith, Adam (1977) . An Inquiry into the Nature and Causes of the Wealth of Nations. University of Chicago Press. ISBN 0-226-76374-9. Smith, Adam (1982) . D.D. Raphael and A.L. Macfie (ed.). The Theory of Moral Sentiments. Liberty Fund. ISBN 0-86597-012-2. Smith, Adam (2002) . Knud Haakonssen (ed.). The Theory of Moral Sentiments. Cambridge University Press. ISBN 0-521-59847-8. Smith, Vernon L. (July 1998). "The Two Faces of Adam Smith". Southern Economic Journal. 65 (1): 2–19. doi: 10.2307/1061349. JSTOR 1061349. Viner, Jacob (1991). Douglas A. Irwin (ed.). Essays on the Intellectual History of Economics. Princeton, New Jersey: Princeton University Press. ISBN 0-691-04266-7. Wikisource has the text of A Short Biographical Dictionary of English Literature's article about Smith, Adam. Culture & Political Economy: Adam Smith & Alfred Marshall. Tabur. 2012. Hamowy, Ronald (2008). "Smith, Adam (1732–1790)". The Encyclopedia of Libertarianism. Thousand Oaks, CA: SAGE; Cato Institute. pp. 470–72. doi: 10.4135/9781412965811.n287. ISBN 978-1-4129-6580-4. LCCN 2008009151. OCLC 750831024. Milgate, Murray & Stimson, Shannon. (August 2009). After Adam Smith: A Century of Transformation in Politics and Political Economy. Princeton University Press. ISBN 0-691-14037-5. Norman, Jesse (2018). Adam Smith: What He Thought, and Why It Matters. Allen Lane. O'Rourke, P.J. (4 December 2006). On The Wealth of Nations. Grove/Atlantic Inc. ISBN 0-87113-949-9. Otteson, James (2013). Adam Smith. Bloomsbury. ISBN 978-1-4411-9013-0. 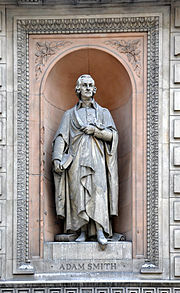 Wikimedia Commons has media related to Adam Smith.